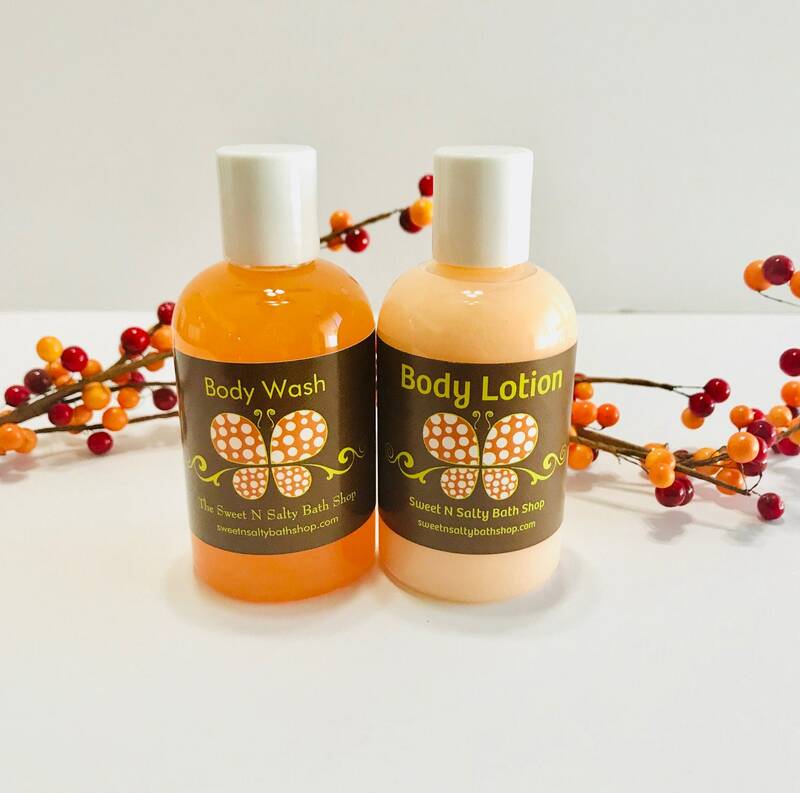 Sweet Pumpkin Spice Body Wash & Lotion-More Scents to Choose From! New Fall Scents Body Wash & Lotion duo cleanses and moisturizes without leaving residue. Makes a lovely Fall gift. Set includes one 4 oz bottle of body wash and one 4 oz. bottle of lotion. Also available in 2oz. Sample Size bottle and large 8 oz. bottle. Each set comes decoratively wrapped, labeled, and tied with a ribbon bow. Body Wash Ingredients:Water, Ammonium Lauryl Sulfate, Glycerin, Disodium Cocamido MIPA Sulfosuccinate, Cocamidopropyl Betaine, Propylene Glycol, Acrylates/C10-30 Alkyl Acrylate Crosspolymer, Disodium DMDM Hydantoi, Fragrance, Colorant. Lotion Ingredients: Water, Cetearyl Alcohol, Glyceryl Stearate, Polysorbate-60, Stearyl Alcohol, Sunflower Oil, Allantoin, Propylene Glycol, Isopropyl Palmitate, Petrolatum, Diazolidinyl Urea, Methylparaben, Propylparaben, BHT, Carbomer, Benzophenone-4, Stearic Acid, Fragrance, Colorant. Visit, like, and follow us on Facebook and Instagram for new products, coupon codes, giveaways and more!